New half day option accessing the Tram Ridge zone. 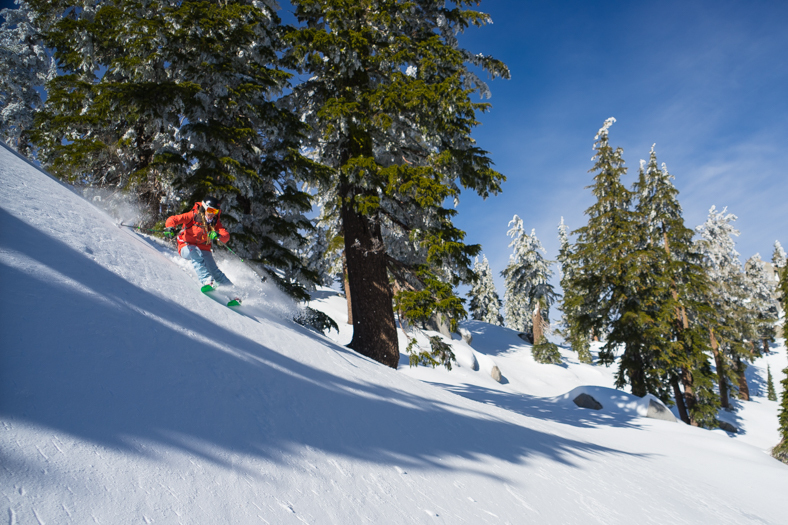 Ski and ride outside the ski area boundaries of Lake Tahoe’s premier resort with Alpenglow’s certified guides. Half day option allows you to use your regular resort skis and boots. Call for more information. 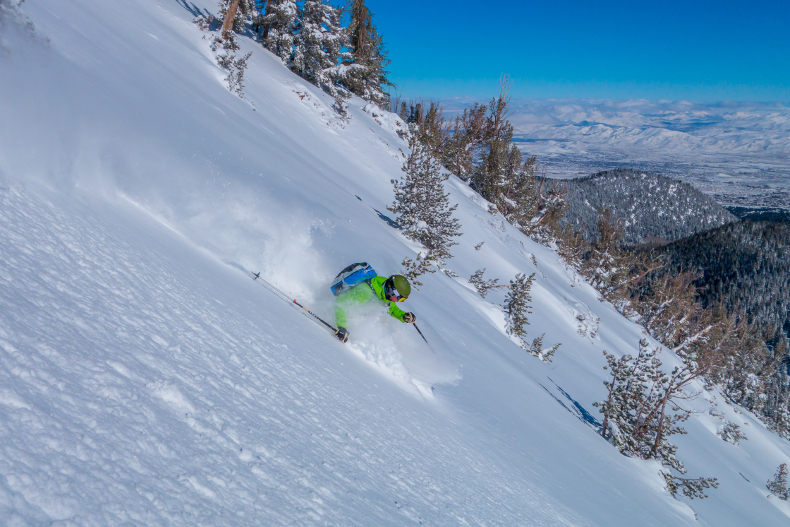 Expanding on our success in year one in partnership with Squaw Valley | Alpine Meadows, we are now offering a HALF DAY backcountry ski experience. Our half day groups will access the Tram Ridge Zone as it allows us to avoid using backcountry skis and boots. 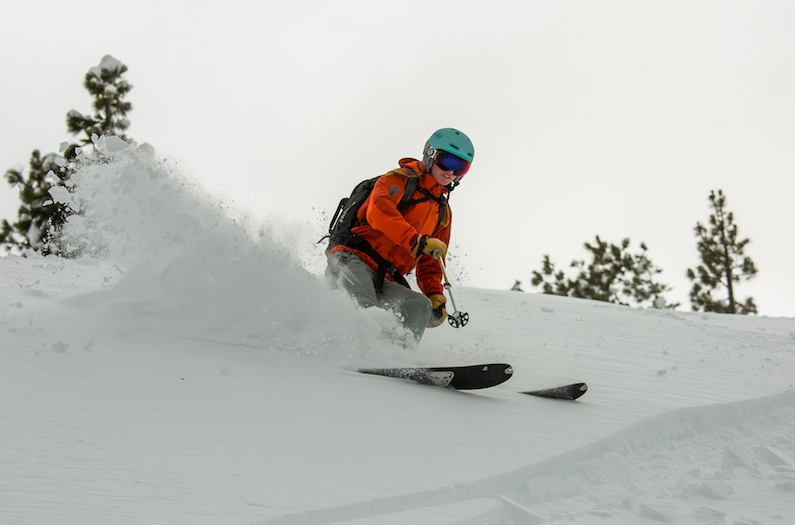 You can get a taste for backcountry skiing using your everyday resort skis and boots. Skiers and riders are still expected to wear avalanche beacon and carry a beacon probe and shovel. Alpenglow provides these items at no cost to all reserved clients. We start our day with a ride on either the Funitel or Tram. We proceed to the Broken Arrow zone within Squaw Valley, and we exit into the Tram Ridge zone through a gate that only Alpenglow Expeditions groups can use. These boundaries are still closed to public. We’re able to ski in the Tram Ridge zone down into Shirley Canyon floating down slopes of various steepness through playful terrain. Near the bottom we make a hard right and use the last bit of vertical to get back to the trailhead. From here we pop the skis off and in 10 minutes or less we’re back in the Village ready for another lap. Even on the most crowded days at the resort, we’ll have this backcountry zone mostly to ourselves. Similar to ski school participants, Alpenglow ski clients will have lift line privileges with their guide to efficiently move toward the ski area boundary. Once in the Tram zone we are immediately in an uncontrolled avalanche area – our guides will be critical in selecting the best lines for us to ski. Most half day groups will get a maximum of two laps in depending on fitness levels and ski ability. Intermediate and Advanced skiers or riders. Skiers and riders must be competent in a variety of terrain and snow conditions. 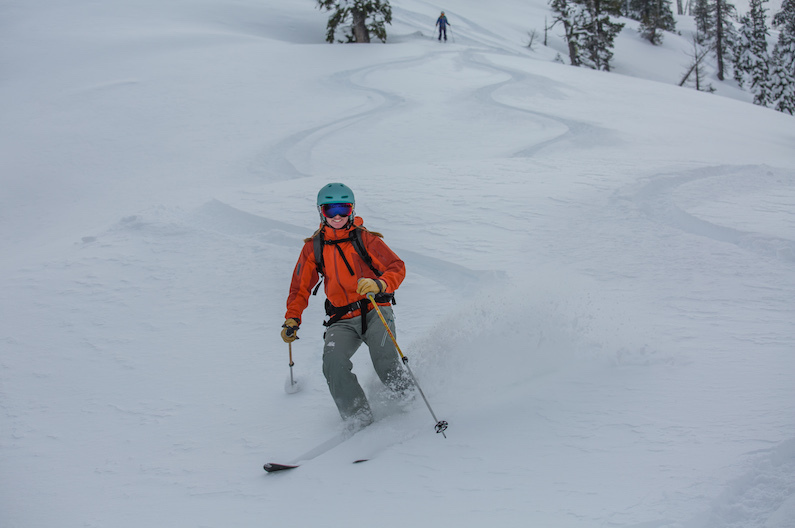 Skiers and riders must be able to link turns on ungroomed runs while maintaining control. This is comparable to skiing ungroomed black diamond terrain confidently. Skiers or riders 12-16 years old can join us with a parent. 16 years and over are able to join without accompaniment. After our morning meeting at the Alpenglow office, we leave the base area and begin the day. After a final safety briefing, we depart from the ski area boundary. After a lap or two, we're ready to have some lunch before finishing a day inside the boundaries, or perhaps we just hit the jacuzzi and soak in the glory of our morning. Can I customize a day for my group? A large portion of our business is designed around custom adventures. Booking a private day gives you the freedom to tailor the day around your goals, pace, and group size. 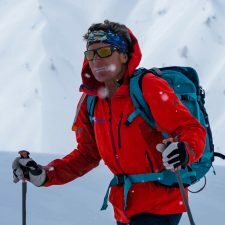 Whether you want to go for max vert gain avalanche awareness, work on backcountry travel techniques, or just explore new terrain, it’s up to you! We usually start our days with fresh ground coffee in our office at 1985 Squaw Valley Road #23 at 8:00AM. Once logistics are all set for the day, we meet at the Tram or Funitel at 9:00AM. What gear do we need to bring? Yes! 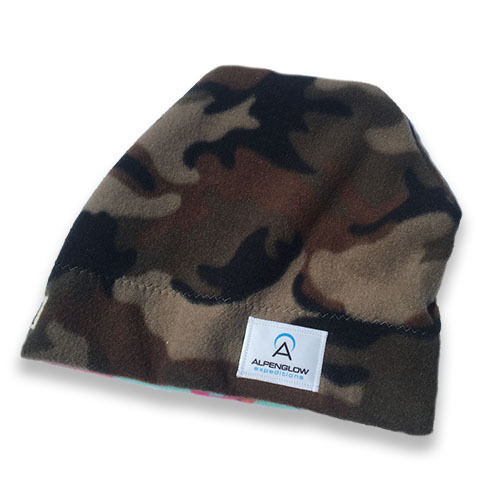 Alpenglow rents beacons, probes and shovels for a small daily fee. Is lunch included on this trip? Lunch is not included on this trip. While you can certainly bring a sack lunch, it is not mandatory. Plenty of snacks and water is recommended! 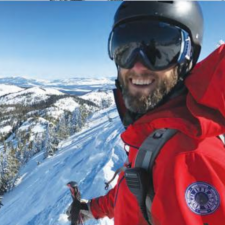 A member of Squaw Valley’s pioneering founding family, Glen first ventured into the side and backcountry terrain surrounding Squaw Valley at the age of ten and has never looked back. His forays into more remote parts of the Sierra Nevada led to numerous first descents and pioneering ski traverses throughout the range. After exploring mountains from Antarctica to the North Pole, Greenland and Spitsbergen, Africa, to the Andes , The Alps to Scandinavia, Russia and China, The Himalaya, Central Asia and Oceania, Glen always returns with a greater appreciation for his home in the “Range of Light”. Whether its descents on skis or climbing alpine rock Glen has an intimate knowledge of the entire range. 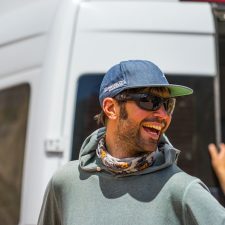 Whether its a local side country jaunt, a Sierra East side adventure, a hut tour in the alps or exploring new first descents in Greenland or Antarctica, Africa or the Andes, he can take you there. 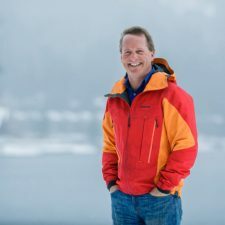 Glen has taken the AMGA ski guide and ski mountaineering guide courses, as well as training with the Canadian Ski Guide Association. 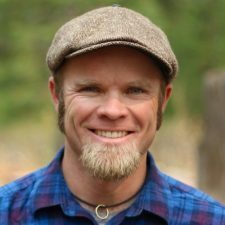 He has an AIARE Level 3 Avalanche and Nols Wilderness First Responder certifications and has been an active Tahoe Nordic Search and Rescue Team member. The Alpenglow program gave me access to a whole mountain worth of incredible terrain right off the backside of Squaw. They have exclusive access to gorgeous north-facing slopes where we found untracked knee-deep powder days after a storm.